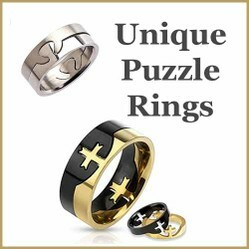 Why not show someone you love them with one of these unique puzzle rings. Interlocking puzzle rings are perfect to show someone that you think you're soulmates. I love the idea that a puzzle ring is a ring that interlocks much like love! The first time I saw these they were called soulmate rings – it was in an advertisement for a local jeweller and I thought what a cool idea. There are lots of different puzzle rings available for both his and her rings as well as for his and his or her and her which means that everyone can show someone how much they love them with this piece of jewelry. 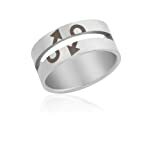 This ring is a Ziovani brand ring made in stainless steel which means it’s high quality. When the rings are put together they show the double male symbol which makes it perfect as a commitment ring or promise ring. These two rings (below) also have more of a ‘male’ feel to them and either of them would be a great puzzle ring to give to your soulmate. There are a number of different puzzle rings that can be used for women, but for a lesbian relationship this ring (below) is a gorgeous statement piece. I think the idea behind an interlocking ring is really romantic as you’re saying you’re the piece of the puzzle I’ve always been looking for. Alternatively you you could be saying you make me complete, let’s face it the saying, “you complete me,” had women around the world swooning over Tom Cruise so a ring that says it……..if that doesn’t work nothing will! This is another stainless steel ring and actually looks like a jigsaw puzzle which I think is cute. Another great thing about stainless steel is that it’s non-allergenic which is more and more important these days. Still with stainless steel we have these two heart puzzle rings which are gorgeous – one is polished and one is brushed so it caters for whatever your taste in jewelry is. Personally I think brushed stainless steel is gorgeous, but that’s just me. A heart puzzle ring has taken over from the broken heart pendants that people used to exchange with their partners on Valentine’s Day or anniversaries and it’s more personal because you need to know the ring size. Will You Be Giving a Puzzle Ring for Valentine’s Day? Maybe You'd Prefer a Necklace? An interlocking necklace has been a way of saying I love you for many years now from school yards to engagement gifts there’s just something about them which really appeal. Oooh. I like these puzzle rings a lot! I've never seen this kind of ring before. Nice idea, Lou. Jewelry is always a great gift to give and to receive.